To my mind the coaches have a certain rustic charm. I'm sure your passengers will like them also. Gazelle and Trailer on the Shropshire and Montgomeryshire Railway. The trailer was converted by utilizing the body of the Wolsely Siddely railbus and an ex horse tramcar chassis. I believe the body may still be in existence somewhere. Ah, the Potts Line, Blackcloud Railways in real life. Twelve inches to the foot scale bodging. Just going to prove that you should never throw anything away. It'll come in useful someday. Regarding the running of the big diesel and level crossing safety, as noted on your latest blog post, the problem will no doubt be solved once the air-horns are refitted. Air horns? It never had any in the first place. Anyhow, the trains have right of way, if road users haven't got the wits to get out off the tracks in time it serves them right, they should look where they're going. Actually, good point. I see what I can bodge together. 1 + 1 = 1 apparently. I'm on the look out for two CHEAP (battered and broken) Thornycroft buses. 1+1=1; like that version. 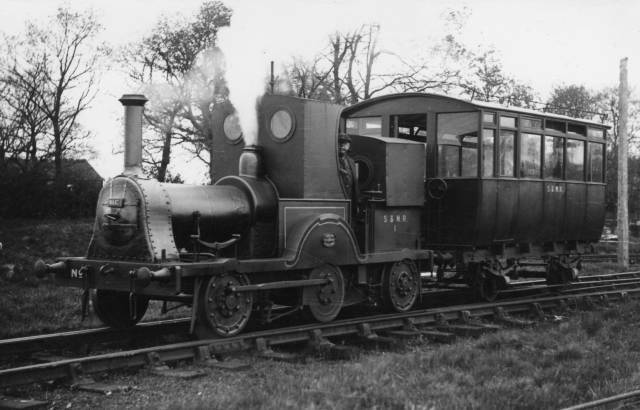 It reminds me of something.........Southwold Railway, perhaps, though the lower tumblehome is wrong for the SR. Would the length suit a 6-wheeled chassis, I wonder? 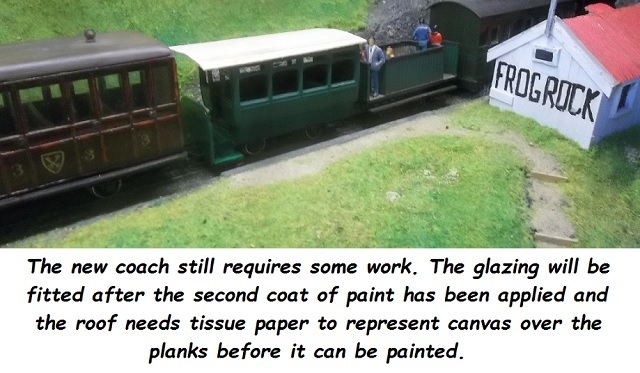 I quite like the first version, better than the eight bay bogie coach in fact. The second looks too short for a six wheeler though. As you say, the lower tumblehome is wrong (the bus has lengthways seating so it can be narrower at floor level). Unfortunately this means the coach would not work with a central luggage compartment because the doors would be too awkward, which is a pity because I like what you've done to the Tri-ang four wheeler. You're right - the first 6-wheel version looks better. 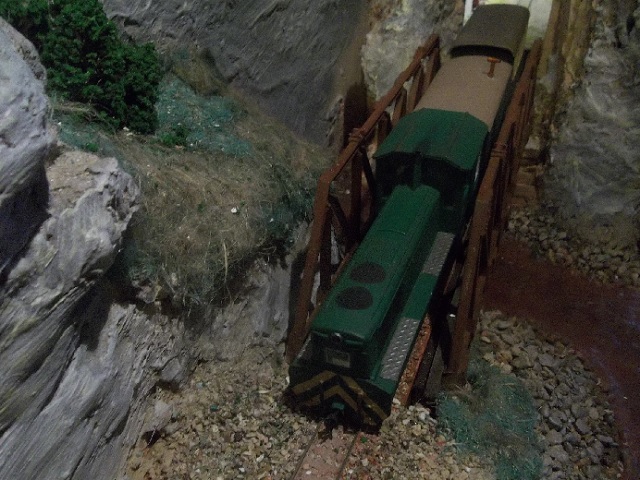 But will you have to take the chassis off the brake van? Seems a bit of a shame. Funnily enough I saw some reasonably priced LMS Milk vans on Saturday and wondered whether to invest, but then spent the money on books, instead. No, I wouldn't dismantle the brake van, or the tender for that matter. I'd have to get another 6wh chassis. The van is normally used with my Magic Train coach to form a local working and the tender will be allocated to loco #2 once it's been weathered and had a Kadee fitted. This morning at Cuarto Sheds. Progress on the clockwork loco, tank/bunker/cab side sheets cut to shape and added. Using the B12 tender should solve the problems encountered with uncoupling. The rocket stick solebar/footplate is a temporary measure because I've run out of Plastruct and my local model shop isn't open on Wednesdays. Progress on the Forney, front footplate added. Progress on the small Mogul, the longer angular tender suits it better than the ex B12 one. Since taking the photos I've added decals to the tender and I'll paint over the hand drawn numbers on the cab sides when the loco is weathered. #60 and #28 still need weathering. Given the problems with unwanted uncoupling and the difficulties of gaining access to the hidden points, might an easier solution, seeing that the loco is never going to do any shunting, be to modify the rear coupling on the tender to a Hornby coupler; you already have a converted wagon, I think - or could make another if a lighter wagon was needed. The loco is looking good, and I look forward to seeing it painted. Can I ask if the coal bunker ahead of the cab is needed to cover a hole in the body? It does seem a bit superfluous now a tender has been allocated, and would give the crew better forward vision. The bunker is over the firebox because the loco's cab was turned end for end and the rear windows are now the front... Due to my inability to get anything like that symmetrical. The original bunker is still there inside the extension. Mainly though, I quite like to look of it that way. The tender is still optional. I could just add a railing on the rear of the footplate for the crew to lean on. The cab is still its original (OO) width even though the roof is wider, acting as a sunshade, so the driver can safely lean out to see where he's going. It got a lick of paint this morning before I went to work, it's in all over black now. I'm hoping to get some of the backlog of weathering done this weekend. 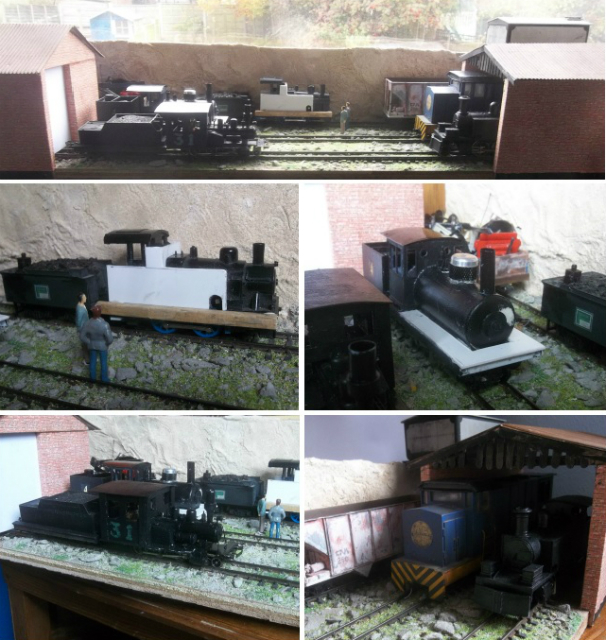 A report from the sheds will be posted, with photos, when available. As for the rear coupler, yes. I think a tension lock is called for. I reckon it might be possible, with practice, to wind the loco just enough so that it "runs out of steam" at Resurreccion. This should mean that it travels more sedately through the tunnel and doesn't rock about so much on the points, southbound as it is slowing down and northbound as it is picking up speed from the stop and rewind. I think I read somewhere that's what John Ray used to do on Crewchester. There was a book with the number of turns of the key that each engine needed for each of the duties it could be rostered for. Must have meant you had to stick rigidly to train make-up, though.